Join us TUESDAY Nite LIVE: BEDLAM IN AMERICA with Katherine Hine hosting activists Ramola D and Dr. Katherine Horton to expose USE OF WEAPONIZED PSYCHIATRY TO ABDUCT NEWBORN FROM HOSPITAL. 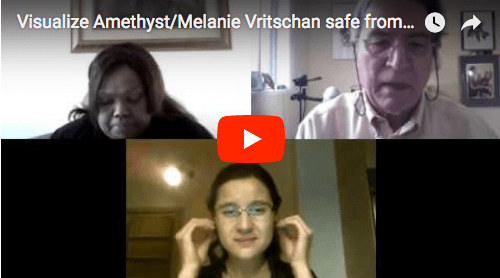 Amethyst Vritschan, newborn baby daughter of JIT (Joint Investigation Team) activist Melanie Vritschan, was taken from her mother less than twenty-four hours after her birth, on 10/19/17, in apparent retaliation for a class action lawsuit filed by Vritschan exposing the use of Directed Energy Weapons and nano-chips against civilians without their consent. Following hours of grilling about her politics, Melanie was locked up in a Belgian psychiatric ward, where she was force drugged, blocked from contact with her daughter or supporters, and kept from her own medical records. They are still keeping the child from her. OR call our GUEST LINE 845-241-9962. Press 1 to join the conversation October 31, 2017. 6-8 pm PST/ 7-9 pm MST/ 8-10 pm CST/ 9-11 pm EST. Tune in to Blog Talk Radio Channel Hidden Truth Revealed: Bedlam in America with Katherine Hine. We will discuss the evidence that electronic chipping in humans is now common, often done during surgery without our knowledge, and what humanity has been doing to put a stop to this. An inactive attorney who practiced over 30 years in the courts of Oklahoma and Ohio, Katherine Hine is now with WLJA radio: www.wljaradio.net, hosting weekly broadcasts exposing illegalities of forced psychiatry in Ohio and the consequences of our current lack of judicial accountability. She continues to serve as executive director of the Ross County Network for Children in Ohio, was instrumental in 2008-2009 in helping rid the City of Chillicothe, Ohio of its traffic cameras through citizen initiative, and has authored articles critical of forced psychiatry in the Columbus Free Press and one article addressing retaliation in the treatise: Expose: The Failure of Family Courts to Protect Children. She can be reached at katherinehine@wljaradio.net.